She was first introduced this year as an ‘Alabama sweetheart’ on the Saturday of the Maverick Festival and what a fine ambassador for her home state Debbie Bond has proved to be. Since that glorious day at the beginning of July, Debbie and her husband/musical partner Rick Asherson have stayed in the country playing countless gigs to continue to promote the state via their brand of inspirational blues music. 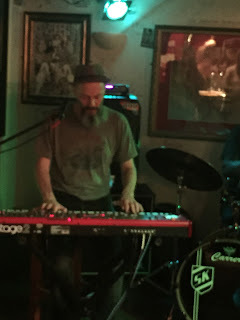 This evening they swapped the idyllic surroundings of rural Suffolk for a more down to earth pub in Bromsgrove, Worcestershire without any let up in their mission to thrill, inform and most of all entertain. 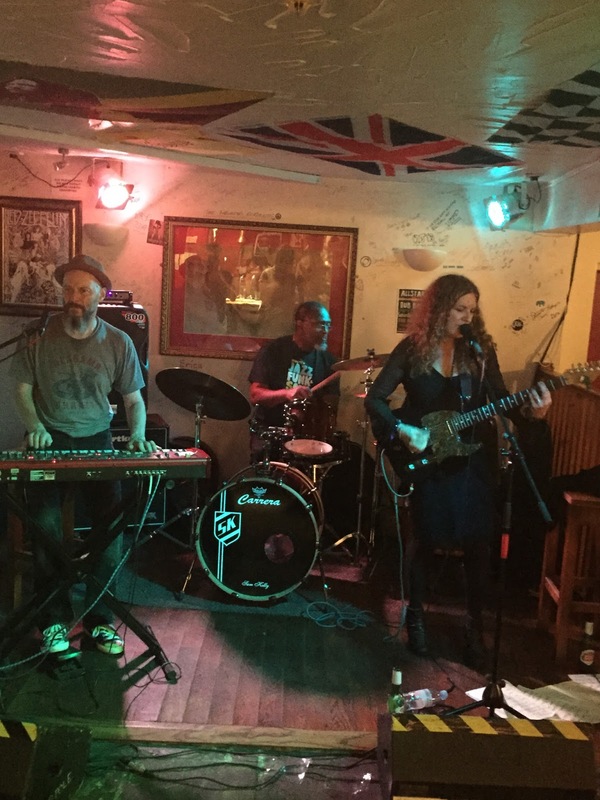 Debbie wasn’t the first Alabama based artist to tread the boards of the Hop Pole this year as Hannah Aldridge payed the venue in March. Co-incidentally Hannah also appeared at the Maverick Festival as part of the themed Alabama feature. While Hannah’s heady mix of country, folk and soul music ventures heavily into Americana territory, Debbie keeps her feet firmly planted in the tradition of maintaining the blues as a relevant art form. This she does with exhilarating passion and a skill to make the notes buzzing out her guitar fizz with electrifying twang. 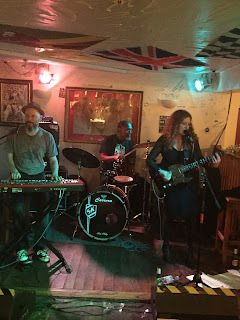 Of course this is in tandem with her exemplary band known as the Trudats and this evening comprising of Rick on keyboards/harmonica, backing and occasional lead vocal, with London based drummer Sam Kelly undertaking the percussion role. It is impossible not to underestimate the impact of Rick’s playing on the show as his keyboard sound underpins Debbie’s lead guitar part with frequent role reversal. However it is his harmonica blowing which raises the eyebrows most, especially with the train song that sees Rick leave the keyboards behind in contrast to his usual dual playing. Listening to this song brought back memories of Debbie and Rick playing a second, and more focussed, set on the Sunday morning of Maverick which probably sowed the seeds for attending this gig. Rick also featured prominently in the call and response number ‘Rick’s Boogie’ which increased the engagement of an audience, in the main just having a pint in their local, but more than aroused by this better than usual ‘free pub gig band’. 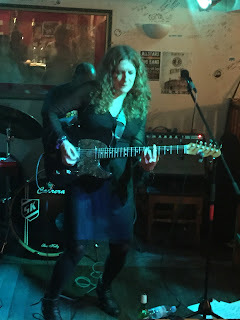 To equate the Hop Pole with an Alabama juke joint is stretching the comparison a touch, but Debbie was unfazed by the surroundings as she was determined to inject a high dose of blues passion to a fairly sedate gathering. To be fair audience participation from the venue was probably maximised by the time Debbie and the guys played their encore version of Muddy Waters’ classic ‘Got My Mojo Workin’’. Debbie was keen to share her definition of the blues as being as much about uplifting your spirits as the alternate view and also to glow about her association with respected Alabama based bluesman Willie King, whose band she played in until his death in 2009. Alongside the re-working of many blues numbers, Debbie was keen to showcase some of her own compositions such as ‘Falling’ which appeared on her 2011 album HEARTS ARE WILD. ‘You’re the Kind of Trouble’ was another track from this album to feature and appear amongst the regular sales pitches of Alabama as a tourist destination, heralded as a music soaked place to rival Tennessee and Mississippi. The passion was flowing for a good couple of hours and hopefully the contents of the tip bucket reflected the sincerity and talent that was on show. With London born Rick’s links to his homeland and Debbie’s almost evangelical mission to spread the word of her beloved state, a return UK visit in 2016 is likely to be on the cards. So if a Debbie Bond gig appears at a venue close by, you could do a lot worse than buying into her belief and pride of a musical style moulded to thrive in any live setting.